Jamie Markham created a mobile app to help N.C. prosecutors, lawyers, and judges determine the correct sentences for criminal offenders. Photo by Mary Lide Parker After a criminal offender has been convicted, judges use a series of paper grids to determine the correct sentence. Whenever the sentencing law changes, the paper grids change, which can result in confusion and erroneous sentences. Jamie Markham created an app to decrease confusion and to help streamline the process. When Troy Powell was convicted of malicious conduct by a prisoner, there was no question he was guilty. But there were questions about what the length of his sentence should be. Changes made to North Carolina’s sentencing law in 2011 have caused confusion for judges across the state. In this case, the judge originally ordered Powell to spend an additional 25–39 months in prison, but because of confusion about the recent law change, he changed the length of the sentence at the last minute. It turns out the judge had it right the first time, and now the case must go to the Court of Appeals, and another hearing will be held to change it again. According to Jamie Markham, a criminal law expert at the UNC School of Government, the number of erroneous sentences in North Carolina has gone up in recent years. When an offender receives the wrong sentence, it results in a lengthy process, costing the state time and money. As in Powell’s case, the conviction stands, but the offender still has to go back to court. 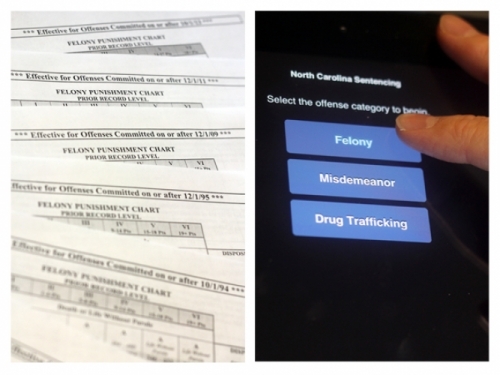 It pays to make sure an offender receives the correct sentence the first time, and that’s why Markham created the North Carolina Structured Sentencing Mobile Application. Creating an app for legal issues is not a new concept for the UNC School of Government. In 2012, Jeff Welty created an app that serves as a field reference for police officers on the law of search and seizure. According to Markham, it’s been downloaded over 8,000 times and received positive reviews. The app features a simple, intuitive design. The opening screen presents three questions: is the crime a misdemeanor, felony, or drug trafficking charge? The user selects one of those options, and then selects a date. Markham says the date is the most important component for ensuring the offender receives the correct sentence. Judges traditionally use a series of paper grids to calculate the length of an offender’s sentence. Because of changes to the law, the grids are adjusted every few years, with significant changes made in 2009 and 2011. When it comes to erroneous sentences in North Carolina, much of the problem stems from confusion about which grid to use. The app ensures that the user selects the correct grid at the start of the process. Knowing that not everyone involved in the legal process uses smartphones or tablets yet, Markham made sure the app’s color scheme perfectly matched that of the traditional paper grids. “So if someone on one side of the courtroom is using the paper grid and a lawyer on the other side is using his iPad, one can ask the other which grid they’re on and everyone is essentially looking at the same thing,” he says. James M. Markham is an assistant professor of public law and government at the UNC School of Government and a member of the North Carolina Bar. Markham won the 2012 C. Felix Harvey Award to Advance Institutional Priorities, a campus-based honor that included $75,000 to fund the project. The app was programmed by Steve Winsett of Main Processor, LLC, in Greensboro, North Carolina.